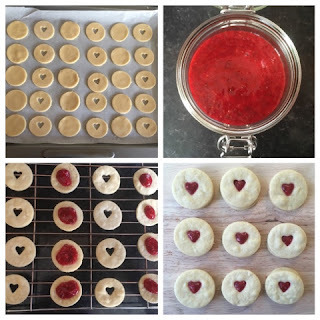 I was looking for a sweet special valentines treat and knew instantly I wanted to try making my own Jammie Dodgers. I looked at a lot of traditional recipes but they all contained a high amount of refined sugar. I knew I wanted to try and make a healthier alternative using only natural sweeteners. I looked and tried a lot of recipes but really struggled to get a good balance between consistency and taste. I then came across a recipe by the Unconventional Baker for linzer cookies and knew I was onto a winner. I played about with the recipe so it was more child friendly but still keeping the taste. I knew that I wanted to use raspberry chia jam as my filling and it accompanies this biscuit brilliantly. 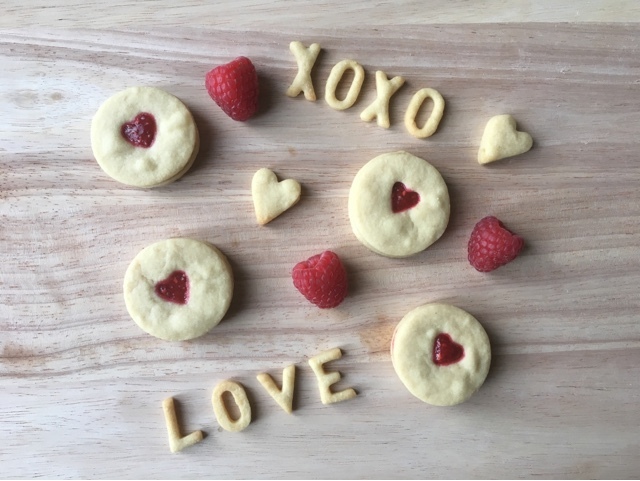 The recipe for the biscuits contain only 3 ingredients and are refined sugar free. These taste great on their own but even better with raspberry chia jam. Raspberry chia jam contains only 3 ingredients and is also refined sugar free. Enough talking, here is the recipe! Simply blend all the ingredients together then transfer to an airtight container and leave in the fridge. Line a baking tray with grease proof paper. In a large bowl cream the butter with a mixer until its creamy. Add the maple syrup and mix further. Then add in the flour and slowly mix it with a wooden spoon or your hands whichever you find easier. If it seems a little sticky add in extra flour. Once mixed together transfer to a sheet of grease proof paper and roll out until the dough is the size of a pound coin. Using cookie cutters cut out the dough into circles or whatever shapes you like then transfer to the baking tray. 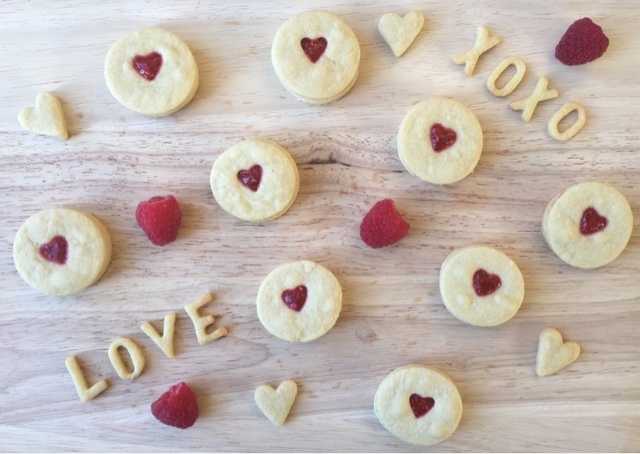 Remember to cut hearts out of the tops of the biscuits using a cookie cutter. Bake in a preheated oven at 160 fan for 6-8 minutes. You really need to keep an eye out as there is a fine line between ready and burnt! Allow to cool on a wire rack. 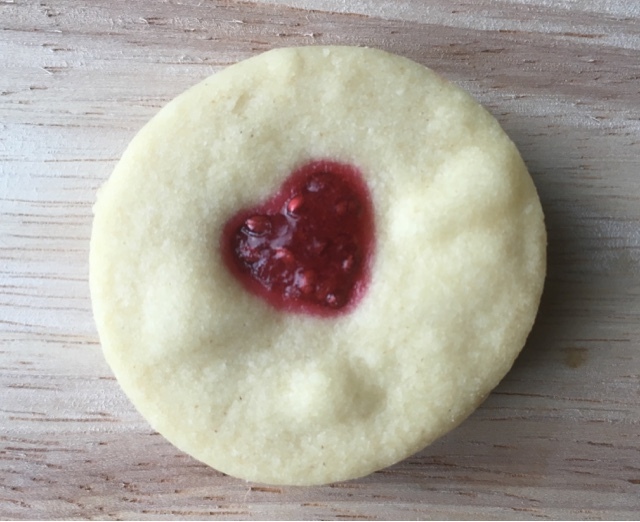 Once cooled add a drop of raspberry chia jam to the bottom biscuit then carefully place the cut out biscuit on top.